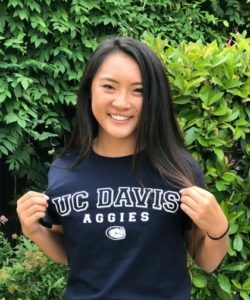 “I am excited to announce my verbal commitment to the University of California, Davis. I am very fortunate to have found a top university that also has a wonderful Division I soccer program. There’s no way to thank my family enough for spending countless hours on the road to get me to games and practices and for supporting me through the ups and downs. You guys are my biggest fans! Being a part of Placer United for seven years has truly shaped who I am as a soccer player. I want to thank all of my coaches, especially Kevin Unsworth, Don Finley and Ron Benjamin for pushing me to my full potential and instilling in me a genuine love for the game. I would also like to express my gratitude to my teammates for their friendship, support and always bringing a competitive mindset to training and games. Thank you to Coach Twila Kaufman and Coach Rachael Collins for this fantastic opportunity and for making the recruiting process an enjoyable experience.